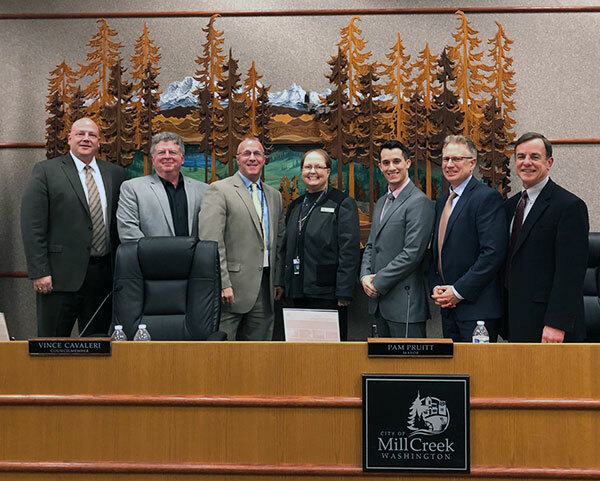 Mill Creek City Council as of February 2018. Photo courtesy of City of Mill Creek. A number of current city councilmembers have experience putting city managers on administrative leave. They still haven’t explained their reasoning for putting previous City Manager Ken Armstrong on administrative leave before terminating his employment just before Thanksgiving in 2014 after two years on the job. City Manger Rebecca Polizzotto lasted three years before the city council put her on administrative leave on June 19, 2018, and engaged Bob Stowe as interim city manager for up to three months on a temporary personal services contract. The council hasn’t explained their reasoning this time either, but according to a number of city staff who spoke on the condition of anonymity, during her tenure Polizzotto created a hostile work environment and lost the support of senior staff that she herself had hired. These same sources said the city council paid an employment attorney to investigate Polizzotto’s management practices. These sources went on to say the city council received the investigation’s findings in a June 13th special meeting closed to the public. Unlike Armstrong’s situation, the city council has not yet started a public process to terminate Polizzotto’s employment in conjunction with putting her on administrative leave. However, at their June 19th meeting they did ask City Attorney Scott Missal to hire a lawyer. Polizzotto’s employment contract requires the city to pay her six months salary if she is terminated for any reason other than “cause,” which among other things includes misconduct against the interests of the city, any fraudulent act, and any violation of the International City/County Management Code of Ethics. The auditor found Polizzotto made a total of $1,622 in purchases “with unclear public purpose” during this period of time. This is the second time the Washington State Auditor’s Office advised the Mill Creek City Council to strengthen internal controls. The auditor’s March 2017 report was very similar. The city council adopted a new business expense policy on March 27, 2018. It’s unclear whether this action was taken as a result of the auditor’s March 2017 report, or because word got out that the subsequent report would show the same problem. What is clear is that at some point the city council needs to decide whether or not Polizzotto returns to work and who will be city manager if she doesn’t.